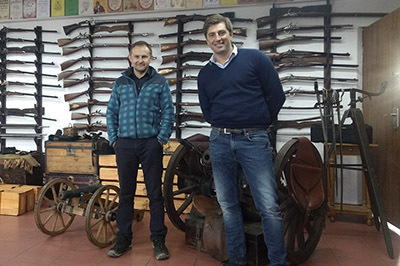 Stefano Pedersoli , the manufacturer of the best black powder guns replicas visited our company. Davide Pedersoli & C is a company founded by his grandfather in 1957, specializing mainly in the production of single-shot replicas of pistols and rifles. Their users regularly win medals and not only in local national competitions but also at the European Championships or World Championships. The history of our collaboration with Davide Pedersoli dates back to 2010, so we are not only selling weapons and accessories from its regular offer, but we also create custom rifles such as the Saguaro Sharps and muzzleloading Rolling Block . It was Stefano's first trip to Eastern Europe for business purposes and our company was the first one he visited. We spent a couple of hard working hours discussing new projects for the years 2018-2019 and testing the prototype of our new Sharps on the shooting range. More comprehensive photo report soon!